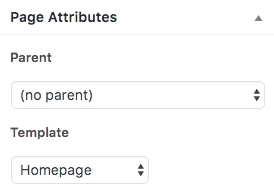 To create new page with Homepage layout, choose Homepage template in page attributes meta box. Homepage template provides layout without page title and any other default content like sidebar etc. Instead of this, it always displays content in full width. So you can build page section by section in Visual Composer and choose layout for every section. As you understand all pages could be builded with Visual Composer plugin, even pages with Default template, but it is recommended switch template to Homepage by described above reasons. To start build page with Visual Composer – choose Backend or Frontend Editor Tab under main editor window. After doing you could start build page with Visual Composer, more information about Visual Composer you could find here. We will cover in details Brooks blocks and some difference provided in default Visual Composer block by our theme in Shortcodes chapter.